February may be the shortest month but around here it was an action-packed one with snow days and guests providing the most memorable moments. 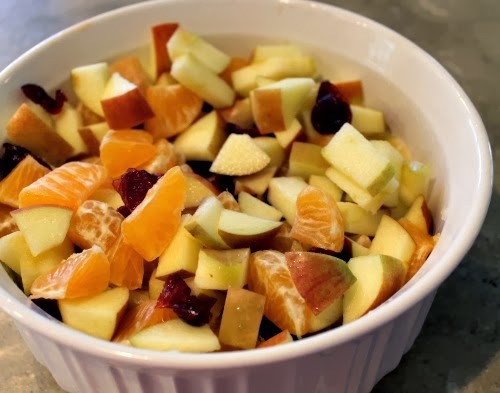 Eating winter fruit salad- apples, clementines and dried cranberries. Rinsing the apple cubes in some lemon (or vinegar) water helped the salad stay fresh-looking even when I made it hours ahead of time. The best things I ate all month: potato bourekas (baked puff pastry turnovers) made by my Israeli friend's mother and potato pierogis (doughy dumplings) made by a co-worker's mother using their traditional Polish recipe. Yes, it was the season of potato pastries made using old recipes by moms! The most successful experiment of the month was lemon curd- a tangy and smooth dessert sauce. And the amazing thing is that this lemon curd is made in the microwave. The original recipe made a rather large batch and I wondered if I could cut it to a third. Dessert sauces can be a bit fussy and there's guarantee that fractions of recipes will work. But you know how I am- always living on the edge- and this time it worked. I cut it to a third for a smaller batch and it still worked beautifully and took 5 minutes tops. 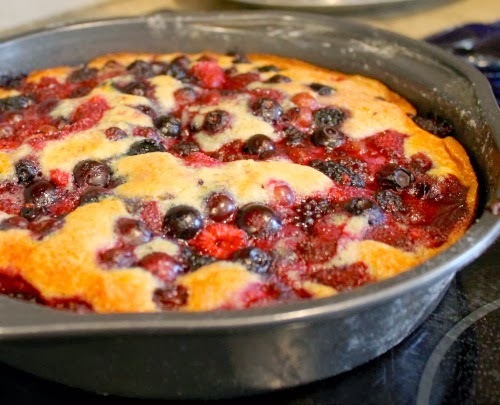 Baking a berry yogurt cake. I used frozen berries because, well, have you looked out of the window? This is an easy, beginner-friendly cake and quite flexible- for instance, I used ricotta and homemade yogurt instead of milk and Greek yogurt, and subbed almond flour for 1/4 cup of the AP flour. The lemon curd was whisked with whipped cream as a topping for this cake, and honestly the tangy lemon curd with the tangy berry cake did not quite work for me- too much tang all around. Next time I'll use them separately. Making itty bitty hearts: A February list cannot be complete without a liberal sprinkling of red and pink hearts, can it? 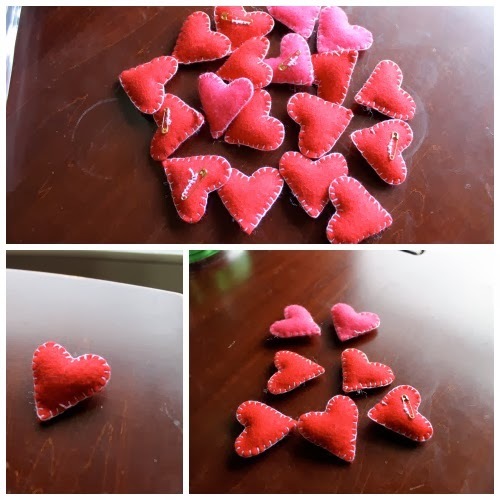 I made these tiny, puffy felt heart-shaped pins for her to give to her classmates for the preschool valentine exchange. The pattern is here on Purl Bee, but I used blanket stitch for edging. Feb 14 is also International Book Giving Day and all the kids in Lila's class were asked to bring a gently used book from home to exchange with each other. Between valentine exchanges and book exchanges, it was a fun and busy day at school. Sewing for superheroes: Our local domestic violence shelter gives out superhero capes to kids who come through their program as a way of offering them support and strength (and a bit of fun) during this very difficult time in their lives. They were looking for volunteers to sew some of the capes for them. I used this pattern and made a few. 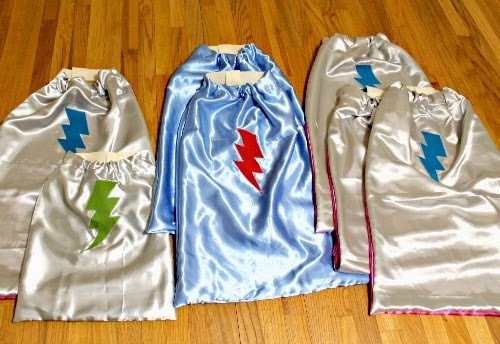 They provided us with this shiny, slippery fabric to make into capes. The stuff was a total pain to sew (it is not well-behaved like cotton) but after some teeth-gnashing I did get them done. When 2 inches of snow/ice (what? don't laugh) brought life to a standstill for 4 or 5 days, a friend and her family stayed with us- they had issues with the heat in their house. We had to work overtime to keep the kids from going stir-crazy. 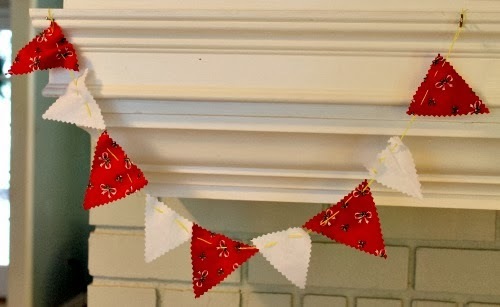 I taught my friend's 6 year old daughter to sew and we made a little bunting. This kid impressed me with her patience and perseverance- especially since she speaks no English yet (only Hebrew) and I was teaching her using a strange language of gestures and nods. Knitting a scarf/cowl- a gift for a friend. It looks like a shawl when worn but slips over the head and stays on without a fuss. The pattern is called Zuzu's petals and it was a joy to knit. If you've seen the movie It's a Wonderful Life, you'll remember the reference for Zuzu's petals. Reading Stephen King's On Writing. The first half of the book is a memoir of King's writing life- his childhood, his early fascination with pulpy horror movies, his earliest writing, his battles with addiction. The second half is a writing seminar with advice for aspiring writers: "If you want to be a writer, you must do two things above all others: read a lot and write a lot. There's no way around these two things that I'm aware of, no shortcut". I've read a couple of King's novels and I find them highly uneven- I love parts of them and the others drag on or seem outlandish (this is strange since millions of people clearly love his work.) But this book I did like from start to finish. Enjoying the unique interaction between toddler and dog. I am always amazed at how patiently Duncan will wait for as long as it takes Lila to do her thing- sometimes, spilling some kibbles, sometimes getting distracted for a minute with something else. But she does it- and takes pride in caring for and feeding a family member just as adults do for her. Duncan finishes his meal in record time (seconds, literally), then comes back to find Lila. He does this unfailingly after every meal- walking to whoever fed him and sitting down next to them- it feels like a thank you gesture. And then he usually burps! One Hot Stove will be on Spring Break next week and I'll see you in two weeks. Meanwhile, do share in the comments what you've been eating, cooking, baking, reading, watching, making and enjoying this February. Oh how wonderful- you've been busy having fun! My parents went to Alaska a few summers ago and simply loved it. In fact, if you e-mail me your snail mail address, I'll send you a Marathi book my mom wrote about her Alaska experience. Congrats on the biscotti- how did it turn out? It is so much fun flipping through baking books and looking for something to try. I made eggless chocolate biscotti, tasted great, the shape still needs more practice. I love reading your end of the month lists. I must try a small batch of that lemon curd, it seems very doable. Reading about Lila and Duncan always brings a smile to my face and warms my heart, love them both! The scarf is beautiful and the tiny hearts look so adorable. I hope you have a fun filled spring break, you will be missed. We've been eating homemade Tamales steamed in banana leaves lovingly made by a colleagues friend, they are truly delicious! I've been cooking a lot this month but I was most delighted when I made a perfect pot of steel cut oats that I loved a lot by Alton Brown's recipe and used my wok after a long time to make some Indo-Chinese Veg Hakka Noodles that turned out exactly as I had in mind. I baked a Valentine's day treat for my colleagues - your crustless mini quiches and some cupcakes that were devoured faster then I had imagined. I re-read Jhumpa Lahiri's Unaccustomed Earth and am currently reading Jeniffer Senior's 'All Joy and No Fun: The paradox of Modern Parenthood' which is not a parenting book, it discusses the changes and challenges that adults face while raising children. It's very interesting so far. We have been enjoying a bag of organic dried figs from costco that are so moist and delightful, I've never had something like this before. Priti- Tamales! So delicious and not easy to find ones that are well-made and vegetarian. I too need to revisit steel cut oats to mix up the breakfast routine a little bit. I've heard about the All Joy book and you reminded me to put it on my to-read list. Hope the weather warms up soon in your neck of the woods!! Love that green scarf! Lila is so cute. I always enjoy reading her and Duncan's interaction. My daughter too mixes all the languages (english, hindi, marathi) while speaking. This month, I made some homemade playdough to give as Valentines for my daughter's preschool. 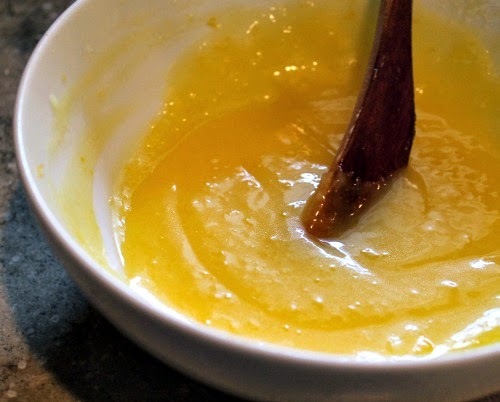 Oh Nikita- if you tried and liked lemon curd, you must try this microwave recipe. Playdough is a such a great idea for a valentine gift. One of Lila's classmates gave her some homemade playdough too! She enjoyed it all weekend. Love that Lila is already learning to help out. Sounds like Duncan and Lila are best buds. The tiny hearts are adorable! I've been using my crock pot a lot lately. My sis-in-law gifted me one in Dec after hearing me say "I'll probably buy one this time" every black friday the past few years. Haha! Surprisingly, I've used it weekly since January and the results have been pretty good. I've made chicken, kheema, chicken broth and a few other things and they all turned out pretty good. Haven't been baking much lately but have bookmarked many recipes to try. I'm currently reading two books, Americanah and Tell the Wolves I'm Home. Both are excellent reads so far. I discovered that I can borrow ebooks from the library and have been going slightly nuts adding titles to my queue. In other news, I'm kind of done with this winter. We are not used to this weather here in Texas. There are icicles hanging from the trees in our yard as I type. Brr..
Anu- I started Americanah but it was not the right time and I gave up. Tell the Wolves is on my list. How fun that you're enjoying the slow cooker. That's one appliance that I have thought about but it doesn't make sense for me for vegetarian cooking when I already have a pressure cooker. I hope the weather warms up soon! It is so chilly and dreary here as well :( not what we expect in March in GA.
Just wanted to let you know that I finished Tell the wolves..and it was worth about 3 stars for me, somehow didn't affect me like it did for so many readers. I am really liking Americanah so far though. Will let you know how I end up liking it. haha! do dogs really burp? I have never had a dog so the image of a dog burping is so funny! :) As always, nice crafts! February was a weird month..my mom left for India the end of Feb and the thought of her going back plus the baby starting day care was too traumatic. :( But we did socialize quite a lot this month and it was just what we needed to keep things sane. I think in times like these the importance of awesome and supportive friends gets multiplied. Neha- dogs do burp (and sneeze and dream and hiccup and snore) and Duncan says he would be happy to demonstrate! Hugs to you with all the changes. I hope baby is adjusting well to day care and that you're getting into a new routine. It is hard, no question about that. And having warm and supportive friends really makes all the difference. Oh those adorable hearts! I wish i had one from Lila! Lila and Dunkie by always make me smile. Duncan burping..LOL! I finished reading Memoirs of a Geisha. I am now reading 'Miracles Happen' by Dr. Brian Weiss. Have you read any of his books? I find his work totally fascinating. He is a psychiatrist and has done extensive work in the field of reincarnation and past life regression. I am planning a small spring break and we will be off this Friday! I can hardly wait! What's with the weather? Truly frightening. Nope, never read Brian Weiss and I'll admit I am extremely skeptical of that sort of thing. Memoirs of a Geisha I did read many many years ago and thought it was interesting. Have LOTS of fun on your spring break!! We're doing nothing special- just staying in town but hope to go on a picnic or two. Of course if the weather cooperates. love it that Lil' Lila(love that don't ya. I love alliterations) feeds Duncan. V does the same here although must say Lila has an early start. V's duties around here now entail feeding Tara, giving her lots of 'lurve' when he comes home from school, taking her for a walk with his Dad in tow, putting on her warm coat(in winter here) and taking her to his bedroom to sleep under his bed. Plus he's always on "tara insult" alert which is if he thinks anyone has hurt her the slightest bit he polices them:-) You can never start them too early I think in learning how to care for a pet member of the family. Have a lovely spring break. If you go out of town does Duncan stay at a vet's place and how does he take to it? LOL yeah I love those alliterations :) How sweet to hear of your little guy and Tara. Since adopting Duncan, we've only taken weekend trips and we take him along (he does great in the car). If we take a trip when we have to leave him home (eg. to India) I'll find a family (maybe pay one of the foster families from the rescue group) to keep him for a few weeks. We have an awesome doggie daycare place here and I love keeping him there for the day or maybe a weekend, but not longer. Lila feeding Duncan sounds adorable -- how cute. Microwave lemon curd sounds easy to do -- will try it out some time. Those capes look great, but can imagine what a slippery project it must have been. Eating -- We are doing a month long marathon cooking from each Indian state, so we are eating a way through Indian food one state at a time. Baking -- Just bought a bread maker and I'm baking more bread frequently now. Enjoying -- the BITTER cold weather ;-) Looking forward to Spring. Yes, the cape fabric was so slippery, if nothing else I learned that I don't enjoy working with polyester! Your cooking marathon sounds completely awesome. 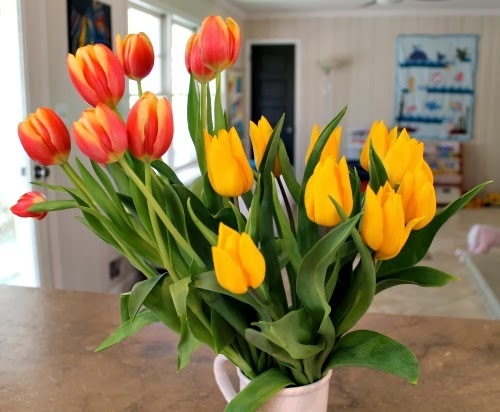 You guys deserve a fabulous spring, seriously!! What an inspiring person you are Nupur. Really look forward to your posts each time. And wonder at the number of things you manage to do. Enjoy your holiday and bless you for cheering me up with your posts! Thanks for this sweet note and it makes my day that you enjoyed this post! Now I am tempted to try making lemon curd! Great list Nupur! Love to Lila & Duncan. I've wanted to comment on your blog but it needs google + which I don't want. Love your posts. I agree with you on Stephen King's books - I feel they start out good and pull you in but the endings usually fall to pieces. And I did like On Writing very much myself, both the biography and the writing parts. You feel the same way?! I have a couple more King books on my to-read list but am wondering if I should even bother. I know what you mean about the snow and grey skies! We need more sunshine and greenery- high time! Lovely...lemon curd in 5 mins...I shd appreciate you living at the edge and taking risks with desserts!! 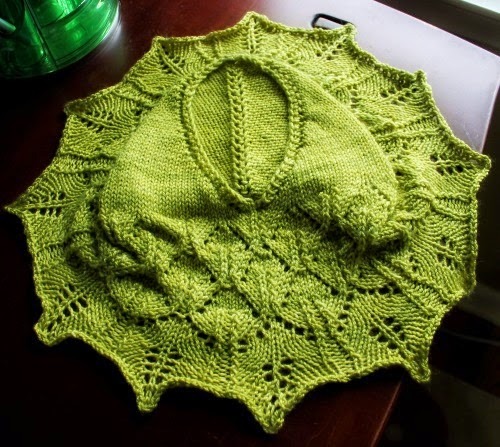 green scowl looks lovely, hope to start crocheting sometime this year. New job is just sucking the energy out of me at work and at home its Amo :P. I love what Lila does for Dunkie and how patient Dunkie ....warmed my heart. Oh man I can imagine- toddlers are harder than babies with their boundless energy! Dear Nupur, such yummy and beautiful things you made! I have added the lemon curd and berry yogurt cake to my list of recipes I MUST make - I haven't tried almond flour before....I love the red hearts (you must be giving all the other poor moms in Lila's class a complex of some sort. :-)) The green cowl is lovely too. You should start a new blog with about Lila and Duncan- so adorable! Hope you have videotaped it. 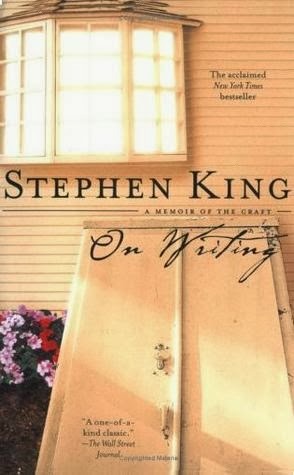 I somehow never became a Stephen King fan but the book about writing sounds good. I think the most satisfying thing I made in February was rice and dal with homemade toop, peanut chutney, loncha and dahi. I really should cook more. Oh R I think you will like almond flour- adds a nice rich and nutty flavor to baked goodies. Middlesex was such a memorable read- it has stayed with me. Orange...has countless gross and highly disturbing scenes. But I got sucked into the lives of the characters and it also has stayed with me. LOL no, I don't think I am giving anyone a complex. Folks around here (thank goodness) are very down to earth. Everyone does their own thang or not! No competitive stuff that I can discern. Hope March brings you good eats! Really loved this glimpse into your month, as always! Thanks PJ, I am sure your little one provides you with lots of entertainment and cuteness- it is a fun age! Oh except for the tantrums! For me 2014 stated with highly hectic schedule @ work, leaving very less or no time to try out anything new. Whatever time I get I just love spending with my son doing all the masti ! Between work and your little guy, no wonder you're busy! Happy Birthday to him. I am sure you have a fun party planned. Your February was certainly action packed, and how cute are those capes? My month was a busy one too, with lots of friends and cooking involved. The best thing I ate was also mom-related-- a lovely Gujarati brunch cooked up by my friend Roshani's mom. :) And we went through the new season of House of Cards and caught up on some of the Oscar nominees on DVD. My top achievement? Getting a meat-eating friend to love chana masala. :) Or maybe it was that I remembered to water my baby curry leaf plant regularly and kept it alive -- not a small thing since I killed my last two! Oh man brunch is an awesome meal to begin with and I can't even imagine how much more awesome a Gujarati brunch would be! Now that Spring is almost here, your curry leaf plant must be happy. Mine is looking droopy and anorexic and I am hoping to put it out to soak some sunshine. God I love lemon curd, could eat it by the bucket. Do you think I could use Meyer lemons for this recipe? A friend gave me a big bunch from her tree and I'm looking to use them up. YES YES YES I think you'll get fabulous lemon curd with Meyer lemons. I made this today with Meyer lemons and it tastes wonderful! And so EASY. Don't think I'll bother transferring it to a bottle--it'll be gone by this evening. I did want to check something--mine looks cloudier, less golden and jelly-like than the one in your pic. Did I get something wrong? Yay! The only thing I can think of is that you left it a tad under-cooked. The lemon curd gets shiny and thick as it cooks. But if it tasted fine, you're OK. Glad the recipe worked for you! I'm going to make another batch over the weekend--I'll nuke it for longer this time. Thanks for the pro tip! This is the first time I read your blog and oh my god, such a dynamic personality you are. Just loved your attitude which says do what you love and enjoy. Thanks a lot for enlightening lot many people like me. There is a lot to be learnt from you. Thanks again!!! English and Biology were my favorite subjects too! And Geography was probably my least favorite followed closely by history (except when my Dad who is a history buff used to explain all the relevant details to me- then history seemed soo interesting). Oooh and I remember the adventures of Dennis. Especially the one about him eating..I was a poor eater as a child so that really resonated ..lol. I hadn't thought about those Russian books for a while- thanks for reminding me! I liked Geography only a bit better than I liked history (which is to say not very much)! Don't know how to move comments from one post to another- sorry my dear!